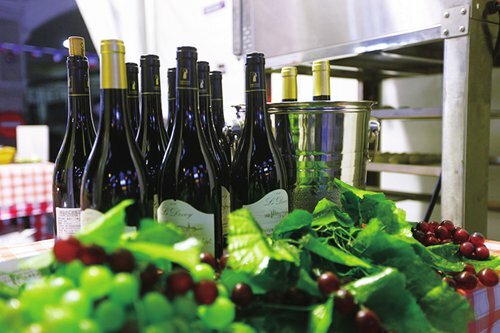 Every autumn, Yandang Road of Shanghai's Huangpu district assumes a Parisian atmosphere during Shanghai French Week. Here, visitors can experience the laid-back French lifestyle, chat with people over a glass of wine and purchase exclusive French products. 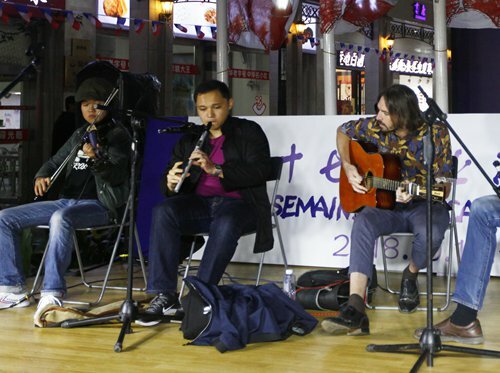 From Monday to Sunday, the 17th annual Shanghai French Week is being held on Yandang Road, with an array of activities that celebrate Shanghainese-style French culture, artistic design, wine, culinary culture, pastry and live music performance. For its opening on Monday, throngs of people showed up despite the drizzle. 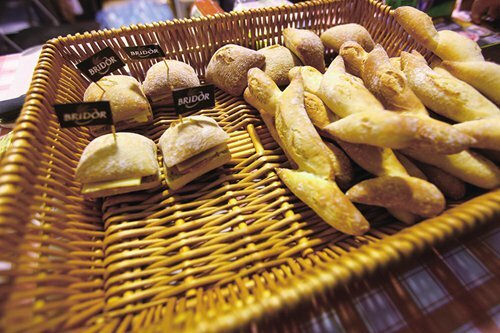 French bread (baguette) is beyond a doubt one of the most popular items of this fair. 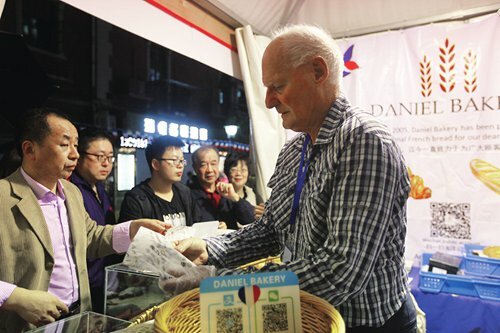 The high quality and affordable price attracted many Chinese customers as well as some passing foreigners. There were long queues in front of every bread stand. 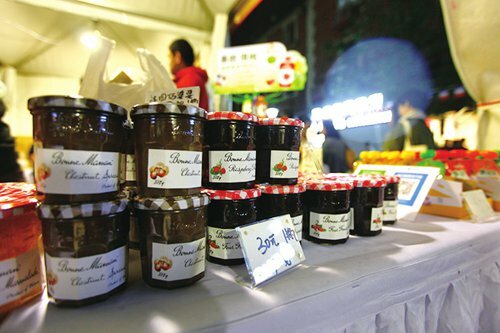 A Chinese resident told the Global Times that she visits the French festivities every year and is happy to see the familiar faces of these foreign stand owners. "I bought some baguettes for tomorrow's breakfast. The price is very affordable," she said. Approaching the end of the street, visitors will smell the scent of fresh-roasted chicken just out of the oven. The owner of this booth is a young Frenchman named Hugo de Mondragon. De Mondragon arrived in Shanghai in 2013. Two years ago he opened a French restaurant DODU in Jing'an district, offering affordable, simple French cuisine. A popular dish from his restaurant is roast chicken, which were raised for 120 days on Chongming Island and prepared in a traditional French style using a home recipe from his own mother. In other dishes, he mixes Eastern and Western ingredients for a unique fusion of flavors. "We have many dishes that are traditionally French but at the same time we add an Asian touch," he said. "It is my first time at French Week. I feel that even though it is raining a little bit, it is going to be a great event. I think there's a lot of good venders and booths," he told the Global Times. 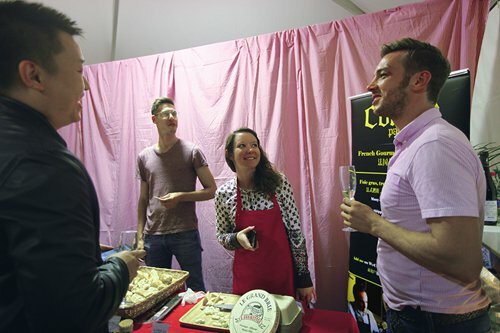 Visitors can also sample and taste authentic French cheese including brie, mild white cheddar and abondance. "There are so many kinds of cheeses in France. I'm glad to introduce all these different types here to the Chinese people," said Lisa Fiorillo, an employee with Cheese Republic. Though Fiorillo only moved to China six months ago, she has been learning Putonghua for five years and holds a master's degree in Chinese-French International Trade from a university in France. "My current job, which is to sell French cheese in China, couldn't be a better job for my major," said Fiorillo. Cheese Republic was founded two years ago by a French expat in Shanghai. They sell French cheese on WeChat and accept orders nationwide. "Our cheeses sell well on Chinese social media platforms. 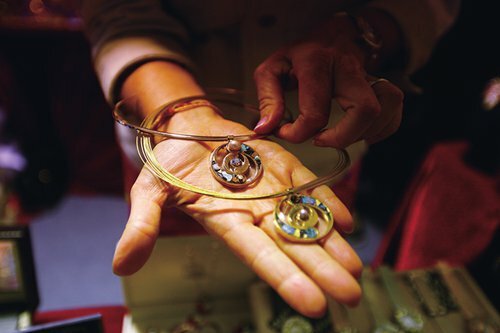 Though our major clients are foreigners, we hope to have more Chinese consumers, who are a huge market for us," she said. Since her role is mainly to select and purchase cheese from global wholesalers, Fiorillo showed great interest in visiting the forthcoming China International Import Expo (CIIE) as a way to connect with Chinese and global traders.